This copyright compliance checklist will help lower your copyright infringement risks. What items on this list are you doing? What new items can you add to your copyright compliance initiatives? 1. Check all licenses for electronic content to determine if any expired at the end of last year. Do you want to renew expiring licenses or allow them to expire? Do you need to take any action to notify the vendor/content owner of your intention to renew or not renew a license a specific electronic resource? 2. Prepare a database of all content your organization has licensed. Whether it’s an image to use on a promotional brochure, or content from an electronic journal, include all content in a single searchable database that allows you to quickly and easily locate that content and determine what rights you have in it. Consider making this database available for others in your enterprise to use when searching for licensed content. 3. Generally, the duration of copyright expires at the end of each calendar year. Determine if any of the works you want to use are new to the public domain since the first of January. 4. Develop the “ultimate” list on what your organization needs (and not just “wants) from its license agreements. Do you need remote access or the right to share a PDF file? Do you need to make printouts or post articles to your intranet? What about using portions of the database for internal education/seminars? Use the list as a set of goals in your future negotiations for licenses. 5. Consider your budget for permissions, licenses and copyright training. Consult various people in your organization to gather their needs and preferences. Prepare a draft budget and ensure you have the funds you need to meet your copyright needs in the current fiscal year. 6. Brainstorm ideas to get share copyright awareness with your colleagues. How about a weekly lunchtime discussion group on copyright issues? Include senior management, marketing and information professionals, and lawyers. Aim for a diverse group of speakers from authors to photographers to web designers to librarians. The discussions can help sensitize your colleagues about copyright rather than being a lecture style format. 7. Continue your own copyright education. Do you need a refresher course on copyright? Or perhaps a course on international copyright or digital copyright issues? See what in-person or online courses are being offered. Are these practical courses where you can immediately apply the information in your workplace or more technical or legal courses? Which is the kind of course that you would most benefit from? 8. Develop a written copyright policy or copyright guidelines or best practices. If you don’t already have one, first determine why you need a copyright policy or guidelines and how you would use them. If you have a copyright policy or guidelines, determine whether they’re effective and how you can improve or update them. Perhaps create a copyright compliance checklist like this one to ensure that you are continually reviewing your important copyright issues. 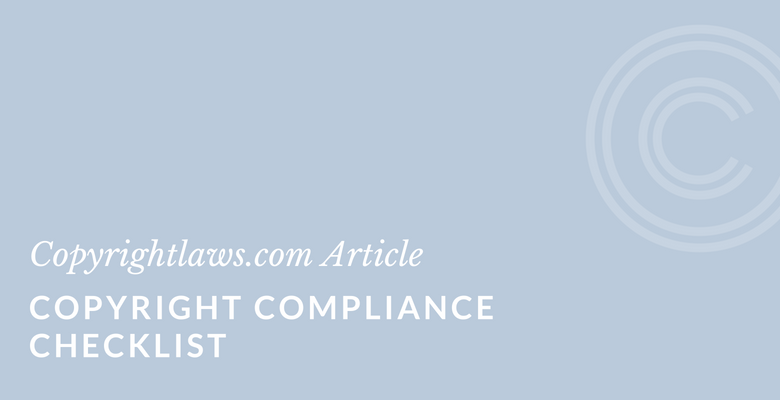 See our article How To Draft the Best Copyright Compliance Policy. 9. Do the same copyright questions arise again and again in your organization? Compile these questions and prepare short, practical answers. Circulating these Q&As to your colleagues or posting them on an intranet may help your organization better comply with copyright. 10. Review recent copyright legislation as well as court cases. Are there any legislative amendments to your country’s Copyright Act that affect you? Or any court cases that interpret the copyright law that relate to your uses of copyright materials? 11. Try to better understand fair use/fair dealing. Is fair use/fair dealing narrow or broad? What research is covered by fair use? Create your own checklist to determine what may constitute fair use/fair dealing in your organization. 12. Create a list of favorite sites and books on copyright so that when you have a copyright issue, you can quickly consult reliable, helpful copyright resources. 13. Investigate how best to follow copyright issues and changes in the law and new court cases. Should you sign up for a RSS feed? Follow someone on Twitter? (Try @Copyrightlaws) Participate on a discussion list? There are free and subscription newsletters that may provide timely and relevant news. 14. Review how you’re protecting your own copyright works from documents to images to podcasts and videos. Although voluntary in most countries, using the universal copyright symbol, ©, is a reminder that copyright exists in a work. Including contact information for permissions will direct people when obtaining copyright permissions. 15. Copyright registration is voluntary in most countries, but consider registering your works with your country’s copyright office. Rather than registering individual works, register a group or collection of works produced during the year to save time and registration fees. Registration is important if you’re distributing your works to the public and may need to enforce your rights through legal action. 16. Review your agreements with consultants. Who retains copyright ownership in consulting reports? If your organization does, make sure that this is clearly stated in your agreement and if necessary provide for an assignment of this work to your organization. If the consultant owns their works, take a look at the rights your organization has in any of the consultant’s work. If you’re a consultant, review what rights you have in your own works. 17. Undergo an intellectual property or IP audit. It’s a great way to make sure all the content and computer software you’re using is legal, and a great way to find out what IP you own and how to market and better profit from that IP. This is true for individuals, as well as small and large organizations. 18. Set up a mechanism for monitoring the legal use of your own online content on an international basis. This can be as simple as undertaking search engine searches, or you could hire a professional who specializes in finding unauthorized uses of content. Piracy is not only the domain of the entertainment industries. You may find surprises in how your organization’s rights are being exploited, and your works used and perhaps even sold without your permission. If you like this Copyright Compliance Checklist, see our Copyright eTutorials.